Because I teach sixth grade science as well as math, I've tweaked a few of the Calendar Math activities to help us build data sets that we can use to discuss our local weather. My students have become so confident and capable at building line graphs! Even better, they offer comments on the weather and make predictions based on what we are seeing. Where to get the data? Of course, a classroom thermometer is the best! Unfortunately my outdoor probe was stolen, and the replacement that I bought wasn't accurate enough for us. Each day I project either Weather Underground or Accuweather data, which varies in interesting ways and can always lead us into a discussion of variations in different places. 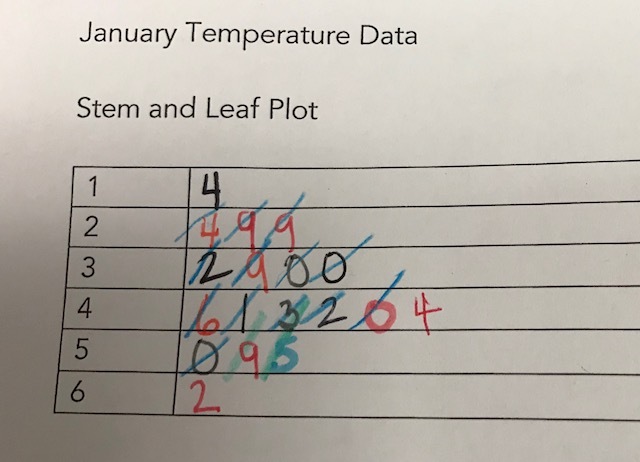 January's activity manual requires a stem and leaf plot, which leads naturally to a discussion of the data that is lost with this kind of display. 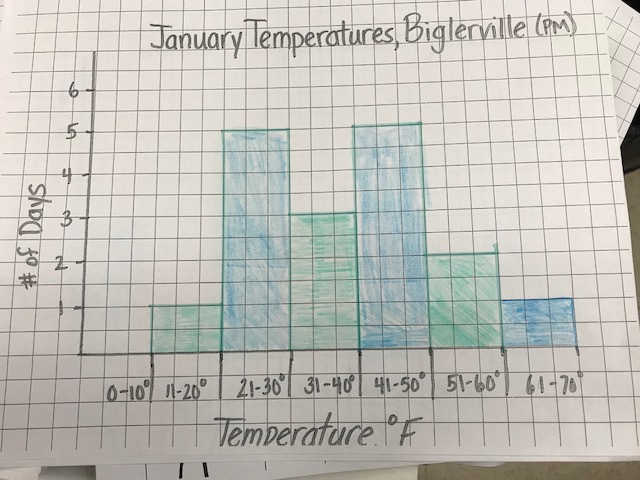 At the end of the month, students used the data to build a histogram displaying the temperatures for the month. For their first histogram experience I built the intervals, while students worked with the data and colored in the values. You'll notice that we had an unusually warm day for Pennsylvania! I've kept student work for next year so that I'll have a ready to go, authentic histogram comparison for students. In February we grew more ambitious: students made a graph to show the daily highs and lows of our town of Bendersville compared with Melbourne, Australia. Why Melbourne? We are at roughly equivalent latitudes, and I thought it would be interesting to compare summer in the Southern Hemisphere with our Northern Hemisphere winter. Creating such a complex graph proved to be a real challenge for my sixth graders, right down to keeping track of the colored pencils they used for each line! 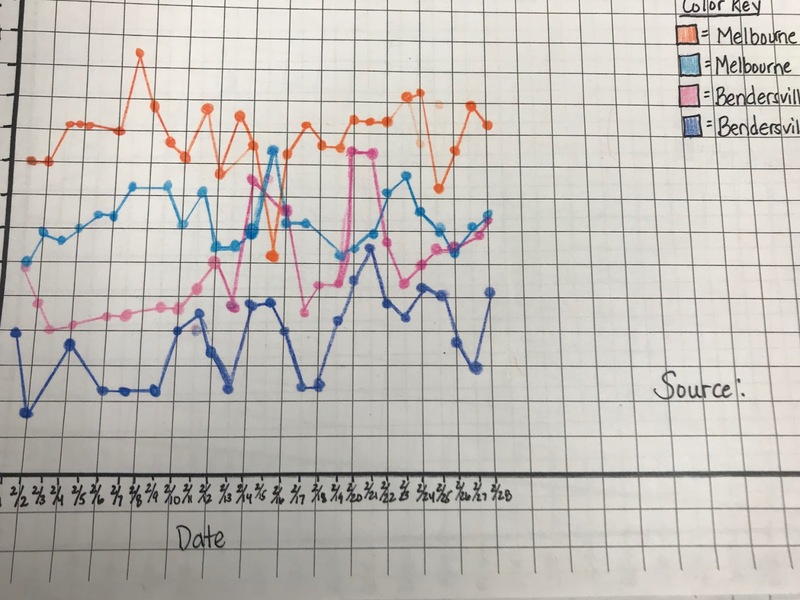 Because they varied so greatly in the time they took to do the graphing, students copied down the data each day, and worked on the graph during homework time or other down times during math. It was very exciting for students in the middle of the month, when the local high overtook the Melbourne low. Mistakes were inevitable (I made a few myself!) and celebrated. We discussed--what went wrong? What could we do to avoid this in the future? In March, we began to explore the daily temperatures versus the historical data. I pulled the historical data from the Accuweather calendar--here's the link to my local one. 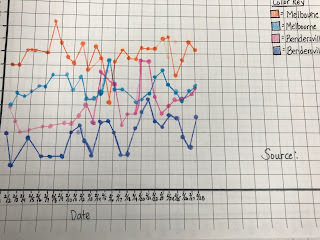 When students started to graph the historical data, they were surprised by how the graph turned out with smooth steps. (Honestly, this surprised me as well!) We discussed why the graph of historical data looks so nice--it's because the data represents decades of data, which smooths things out for us. 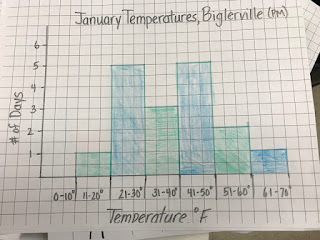 When we started graphing our daily temperatures, students noticed much more variation than the historical temperatures. At the end of the month, students found landmarks of data for both the historical information and the monthly data. What did we find? If you were on the East Coast in March, you know that it was cold! Both the median and the mean were colder than usual, which led to a conversation--where were temperatures warmer than usual? Students went to the weather sites themselves to find the answers. We also found that the historical data was already arranged in order from least to greatest, which made finding the median much easier. This lead to a conversation: Would we see this in every month? (Hopefully not) Which months might not have the data in order from least to greatest? Why? the median and the mean. 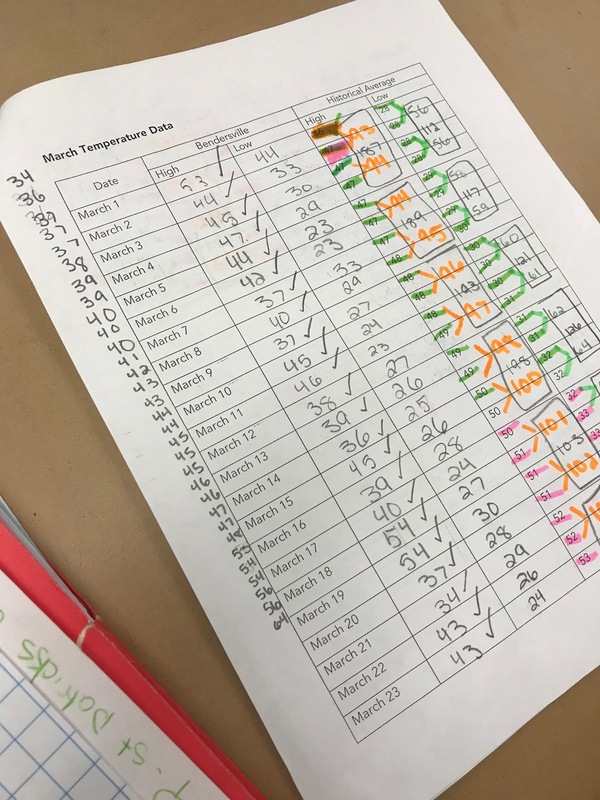 In the month of April, students have been extending their investigation into actual versus historical temperatures. It was heartening to see how competently students went about this process. 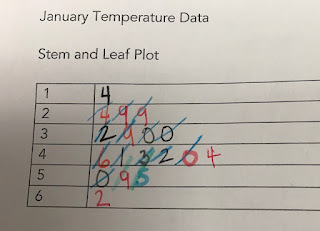 When I made a mistake on the graph I copied for student use (I wrote a date twice), some of them cast aside my graph and made their own. This was great! I was glad that I went beyond the scripted activities and into tasks that were meaningful for my students.